Chander Taal or Moon Lake is a barren but beautiful lake located at a height of 14100 feet in Himachal Pradesh in northern India. It comes under Spiti and Lahaul district of Himachal Pradesh and is situated at a distance of six km from Kumzum Pass. The lake got its name because of its crescent shape. It is believed, Chandratal was discovered by traders who came to the region from Tibet or Ladakh. The sweet water lake is around 2.5 km wide. It is the source of Chandra River which merges with Bhaga River to form Chandrabhaga River and later assumes the identity of Chenab. The lake can be visited only during the three summer months. For the rest of the season, the lake remains cut off and frozen. The lake is normally blue but changes color with the color of the sky. Chandra Bhaga mountain range (CB Group) forms the perfect backdrop for the lake. Though the place is barren and bereft of any human settlement, it is a famous camping site during summer. Travelers often get awestruck by the blue colour of the lake, bordered by wide carpet of green grass coupled with the pristine white of Chandra Bhaga mountain range.Along with it when you can feast your eyes with the unparalleled beauty of this landscape, unique in many respect compared to the other Himalayan treks. The clear blue sky and the rugged brown rolling mountains, almost treeless, form a picture perfect image. This landscape goes on for miles interspersed with lush green meadows, and the sparkling Chandra river down below. The days are not cold but the temperature drops quickly after the sun sets, and the wind adds its bit. The best way to keep warm is to wear clothes in layers. 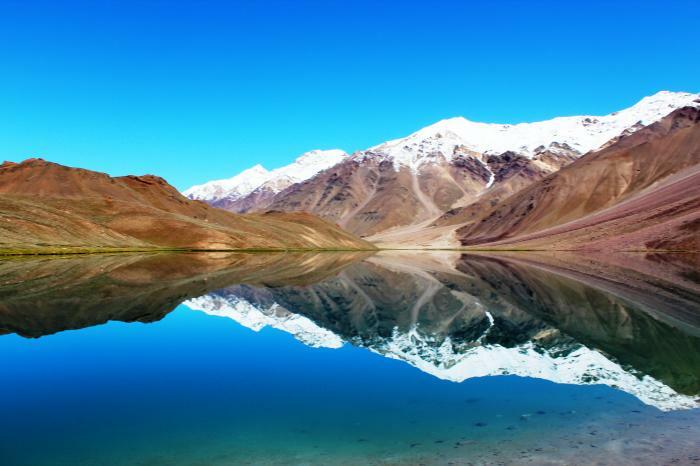 Suraj Tal is also accessible from Chandra Taal, 30 km (19 mi) away. Vast meadows on the banks of the lake are the camping sites. During springtime, these meadows are carpeted with hundreds of kinds of wildflowers. Situated at an altitude of 16,040 feet, Baralacha La Pass is a high mountain pass in the Zanskar range in Jammu and Kashmir. It is a high plateau where three different mountain ranges - Pir Panjal, Zanskar and the Great Himalayas - meet at an altitude above 16,000 feet. 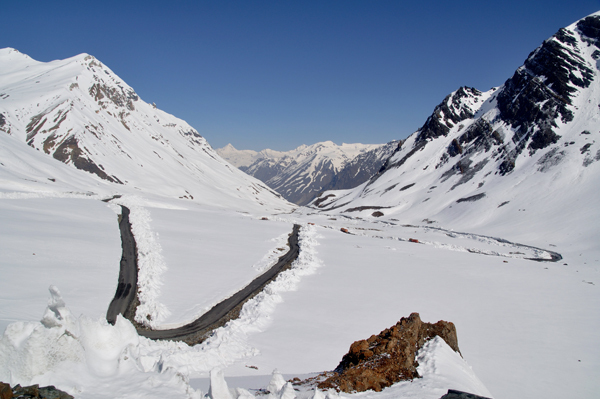 This mountain pass, one of the highest passes in Ladakh is around 73 kilometers away from Keylong on Manali - Leh road. Just a few kilometers away from the Bara-lacha Pass towards Manali is the Bhaga river, a tributary of the Chandrabhaga river, which originates from the Surya Taal Lake. 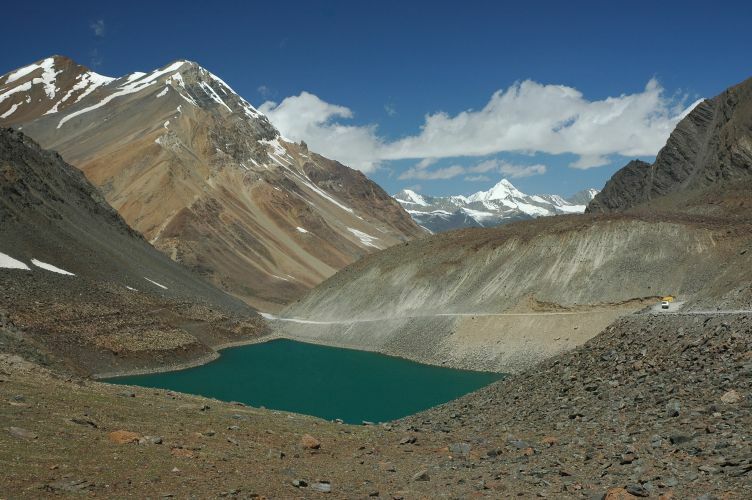 This pass is the point of commencement for several treks which include the famous Suraj Tal trek and Chandra Tal trek. During the winter season the pass is closed due to heavy snowfall. Chatru is a small village in Himachal Pradesh in Mandi District which is 85 kilometers from Manali, we can save some time by reaching here in our Cars. Chatru can also be reached through beautiful Hampta Pass from Manali. Tucked away hidden in the vast expenses of the rugged Himalayas, a tiny little hamlet Chatru stands out like an oasis in the middle of this "high altitude cold desert" of Spiti in Himachal Pradesh. Its a 16 kilometers long trek which can be done on motor or by foot on road leading to Rohtang and Kunzum Passes. Normally we could do this by car but in case there is a lot of snow we can always walk. Batal is located on the foot of Kunzum Pass that provides access to Spiti Valley, There are seasonal shops providing food and shelter. Chandra Tal is the most beautiful lake in Himachal Pradesh. According to Hindu mythology, Chandratal is the place where Indra, the King of Gods, came down on his chariot to transport Yudhishthira, eldest of the five Pandavas, in his mortal form to Swarga (heaven). Locals believe that fairies visit the lake at night. The mountains peaks with snow caps and slopes around the valley rise up to 3000 meters to 6300 meters. Again there is a motor able road till Chandra Tal, accessibility of which is highly dependent on weather conditions, however there is another trail which ascends from here to Kunzum Pass and takes us down to Chandra Tal in 9 kilometer trek. This is an adventurous trek as Ice Cold river and many water streams needs to be crossed. It's best to cross this river in early hours of morning when the water levels will be low and should follow instructions of the guide at all times as this is a dangerous patch and many people have lost their lives crossing this river. Its best to remove shoes while crossing and always find the shallow patch before making the crossing attempt by using the walking stick or follow the group. Rest of the trial is fairly easy. Its a rugged terrain, cold desert and many confusing trails not to mention again many water streams crossing over icy cold waters over tricky terrain and glaciated lakes, must follow guide at all time. After the climb it is a straight walk to a very pleasant flat and grassy campsite with beautiful views. One can see the snow-capped peaks in the distance (across the river) and one is hemmed in by mountains all around. There is a “gaddi sheperd” encampment at this campsite. We camp here tonight. This is a comfortable walk. Big stretch of plains leading upto the Baralacha La South, which is marked by numerous cairns and prayer flags. There are impressive mountain views of the Himalayan Range. One stream needs to be crossed before we reach Baralacha Pass. The views here are breath-taking and your hands will grow tired clicking pictures. Along will come Suraj Tal which is third highest lake in India and 21rst highest in the world at 4550 meters (15000 feet). From Baralacha Pass, our cars will be waiting for you as you will be transported comfortably to the magnificent town of Keylong whichre is 65 kilometers from here. For a much needed rest and comfortable stay in your hotels. Click here to know whats included in your package and why choose us?